First of all, you have to decide what the filling is. 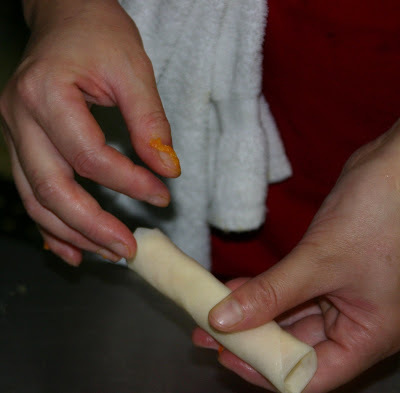 In these spring rolls, we are using a simple filing of mung bean sprouts, shredded carrots and egg plus seasoning. You will noticed that the egg is scrambled and mixed with the ingredients and yet the other ingredients are not overly cooked. 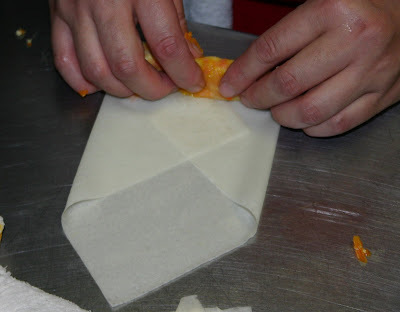 This is important, no matter what you decide on what you want to use, make sure you have some crunch in the roll before you deep fry it. 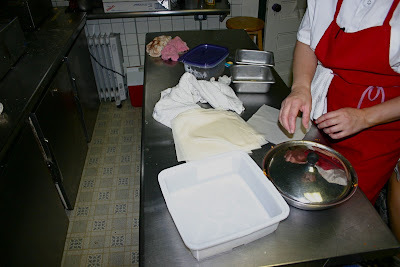 The first thing is mis en place. You have to be prepared. Notice how Nancy is keeping the wrappers moist with a clean wet towel? 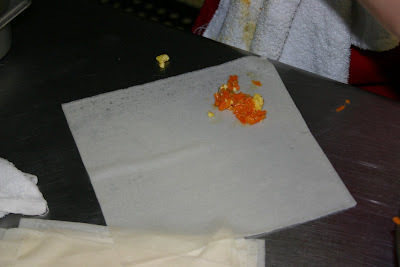 The next step is to place small amount of the filling on the corner of the wrapper. 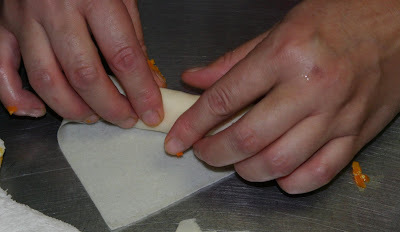 Then rolls the spring rolls as tightly as you can without shredding the wrapper. 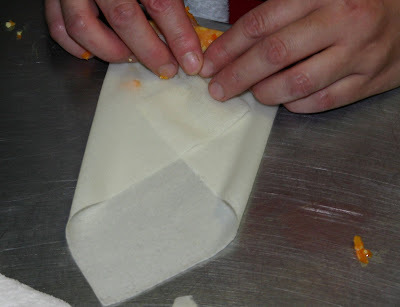 After you've started the roll, about two to two and a half turns, fold in the sides. Until you have a nice even shape. You can now put these in a Tupperware and leave in the fridge for a day or two. However, you probably want to fry and eat these right away. So, heat up your favorite frying oil. Make sure it is hot enough for deep frying. Nancy holds her hand above the oil, if it feels hot, it's done. Don't try this at home kids. Use a thermometer. Gently put them in the oil. Always lay them away from you so that you don't splash yourself or your assistant. Fry until they are a light golden color. Drain them on paper towels and enjoy. Make sure they are cool before you put them in your mouth. They are HOT coming out of the oil. 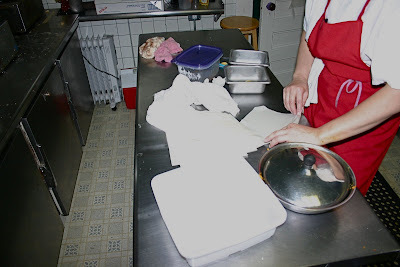 Obviously, you can lay them in by hand but use tongs when turning them or taking them out. Don't touch for at least 3-5 minutes. Let's not get burned!